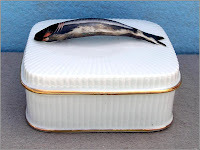 Perhaps you thought sardines were so low-class that they wouldn't dare complain no matter how you attacked them. Actually, they were once used to grandeur, living in little silver boxes, where they were approached with sardine tongs. Any fool can recognize sardine tongs because they have sardines carved on them and are smaller than broad asparagus tongs or sandwich tongs, not big and narrow like steak tongs.